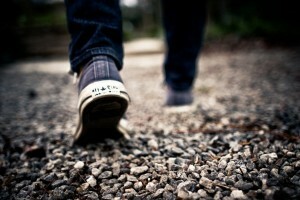 A path can begin with a single pebble. Peace can begin with a single act. As the world population has grown beyond six billion, Shinnyo-en Foundation’s peace initiative, “Six Billion Paths to Peace,” evolved into Infinite Paths to Peace. It is our hope that this initiative will continue encouraging ALL of us to explore and identify how our values, talents and passions can be used in our daily lives to serve others. Your contribution to the world might start small like the first steps making way for a larger path, but we believe peace can begin with a single act regardless of its size. The core principles and assumptions embedded in the initiative have not changed. Following this, our Paradigm of Service describes a process that might help you begin a journey of finding what your path to peace is. We hope that with Infinite Paths to Peace and our Paradigm of Service you will live your life fully and intentionally for the sake of creating a more harmonious and peaceful world. 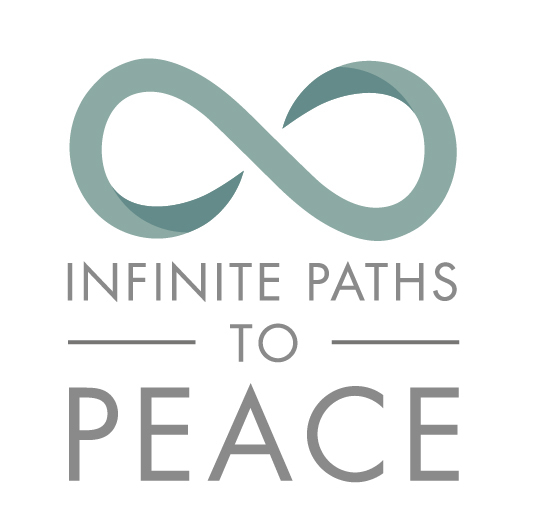 Infinite Paths to Peace is an initiative to inspire people to reflect upon the individual contributions that each of us can make to create more harmony in an interconnected world. As humans, we have experiences and histories that are individual and idiosyncratic, and shape who we are. However, regardless of our differences, our lives are linked by common desires to live our lives fully with a sense of happiness, acceptance and peace. It is easy to feel overwhelmed or hopeless by the suffering, injustice or violence in our world. Just as an act of violence sends shock waves, affecting everyone around, so too does an act of service. Each of us has a choice. You can turn away and ignore the challenges. You can react to challenges with anger and frustration. Or, you can approach challenges with an attitude of service and notice that there is much you can do. Choosing to see the world from the perspective of serving others creates the possibility for greater joy and peace. 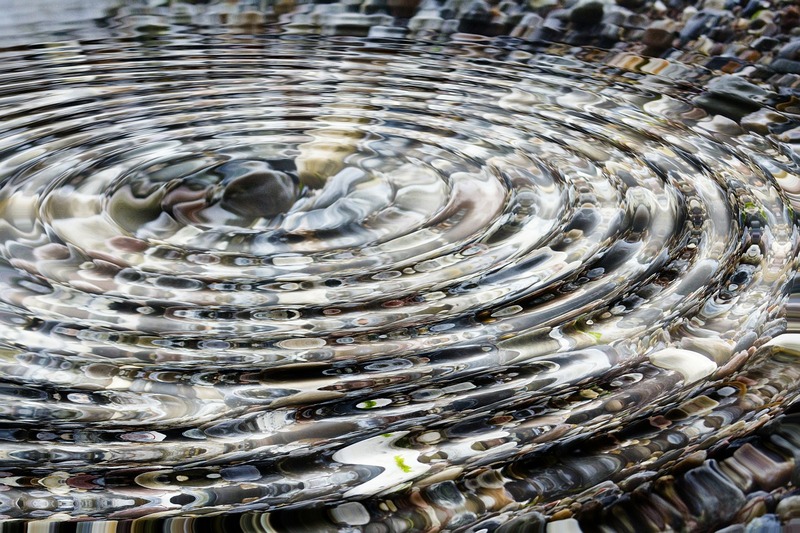 Like a drop in water, each small act of service could reverberate out into the world expanding the experience of peace for all of us. A teenager loved to scrapbook. 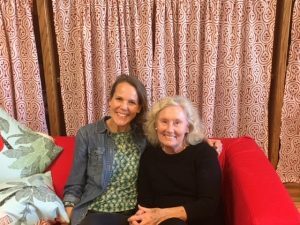 She lived close to a residence for people suffering from dementia. She asked the caretaker if she could help somehow and the caretaker said that making scrapbooks for the residents would help them connect and hold on to memories that they had. The families of the residents were thrilled to see how engaged their loved ones were with the books. 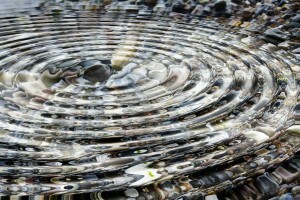 Like a pebble, each small act of service could collectively add to a path to peace. Beehives were long outlawed in neighborhoods in the city. With the increase in Colony Collapse in beehives, one student suggested that his school enlist the help of bee keepers to host a beehive on top of their school. The school agreed, but the city council did not. Students investigated the condition and alternatives, prepared a presentation and action steps and attended a city council meeting, urging the council to change the law. The request was turned down, but that was not acceptable to the students. They continued to build support in the neighborhood, going door to door, educating their neighbors about the declining bee population that would impact their food supply and flower propagation. Students built enough support that when they returned to the city council, new legislation was enacted, enabling not just the school to host a bee hive, but other community members to do so as well. 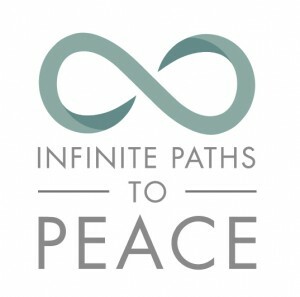 Infinite Paths to Peace represents the idea that it is possible to inspire new reverberations of peace through service if we each step up to deeply reflect on our values and passions, and make a commitment to offer our unique contributions to the world. There are so many ways to serve and walk towards peace. We want to know: What’s yours? What follows is our Paradigm of Service. It explains how we approach service and offers a list of reflection questions along the way to help you define what your path to peace is. We invite you to actualize this initiative and paradigm by heightening your awareness of self and your unique ability to create peace in your community and beyond. Service remains at the heart of Shinnyo-en Foundation. We believe that a service-orientated life provides all people with the possibility of joy and peace. Because of this, we focus on engaging young people in service, and in promoting a kind of service that is based upon the alignment of an individual’s heart, mind and actions. What is Service? Rather than being a particular kind of action, we see service as the result of a particular type of intention. We see service as a combination of both the external actions we take in the world, and the internal motivations that drive our actions. We believe that the most meaningful form of leadership through service happens when a person is aligned – when their attitudes, beliefs and values line up with their heart and outward actions in a way that brings about maximum joy and energy. By looking into what motivates you to serve or lead, you can make more conscious decisions about the actions you take. As you become more aware of the connections between your actions and your attitudes, beliefs or values, you can learn to shift any of those elements so that service can become more meaningful to you. Identifying Your “Roots and Fruit”: Exploration of one’s self is the most difficult, and yet the most accessible in this view of service. Every individual can begin to explore their own roots of service. To begin this reflection process, imagine yourself as a tree. The flowers and fruit of the tree represent the outcomes of other-centered actions. They represent the specific ways in which you bring greater joy, harmony and positive energy to the world. Like the many types of trees, we all grow and blossom in many different ways.The part of the tree that exists below the surface of the ground represents the inner dimensions of service – the attitudes, beliefs and values that root an other-centered approach to life. Some of us have an extensive root structure, while others have a less complex version. These submerged, invisible dimensions of service are usually developed early in life through our experiences in our families and in religious, social, cultural or educational institutions. Often, they are unconscious until something inspires us to investigate ourselves more deeply. The trunk and branches of the tree represent the way in which the fruit and roots are connected. Inside the trunk, sap flows from the root systems up to the most distant bud to feed its growth. 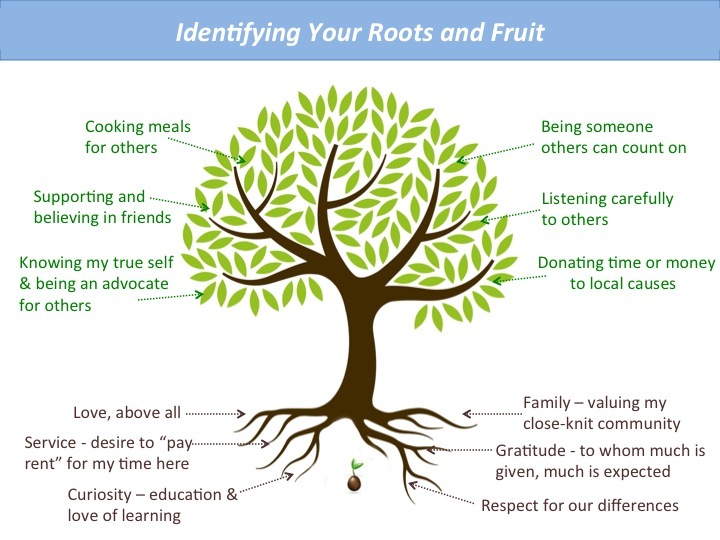 Our consciousness about the connections between our roots and fruit help us to act with purity and energy.You might consider asking the following questions to explore what your roots and fruit are and how they are connected. What are your roots of service? What is the fruit of your service? How are your roots and fruit connected? 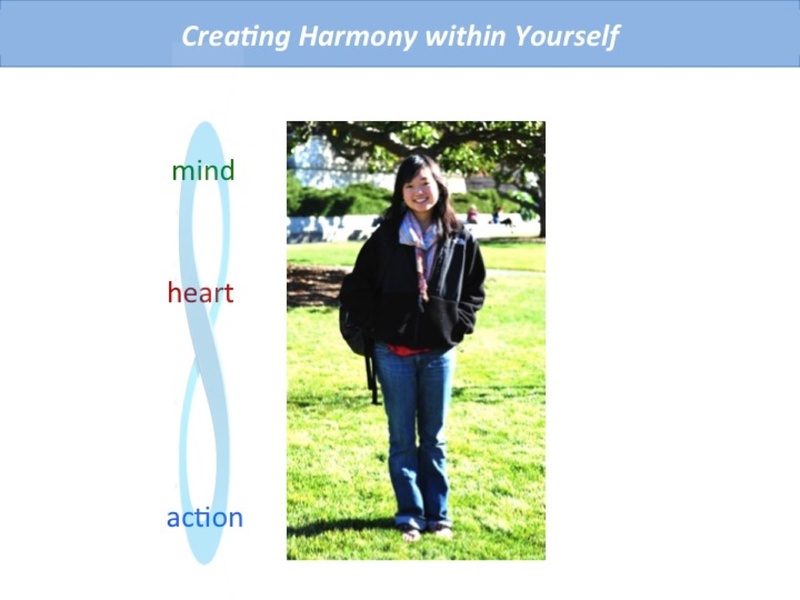 Creating Harmony within Yourself: Most of us can relate to the feeling in our gut when we are doing something that we don’t agree with. This feeling rises from your mind (cognitive thoughts), heart (emotions) and actions (physical movements) being out of alignment. With awareness, we correct the action, or shift our way of thinking about the situation so that it creates greater harmony between our mind, our heart and our actions.The awareness of “being in alignment” is a continual process. In each moment, factors in our internal and external environment change. We have to be flexible and adjust ourselves to move with these changes. Sometimes this requires us to have a new relationship with our thoughts, or emotions. At times, the needed adjustments are huge, and life-altering. Most of the time they are not; they are minor and can be made on a very subtle level. The most essential element of this adjustment process is deep knowledge of yourself. Knowing what you value, having a sense of your unique tendencies or patterns of behavior, and understanding some of the ways you get caught out of alignment are all very useful. With that awareness, as situations arise when you feel out of alignment, you can pause and take a moment to reflect upon your thoughts, emotions or actions. In what ways are you living out your core values right now? When have your values and actions felt in sync? When have they felt out of sync? A Möbius strip, illustrated in blue in the diagram, is a symbol of a never-ending process. This is how we believe energy moves within oneself, constantly moving and adjusting. 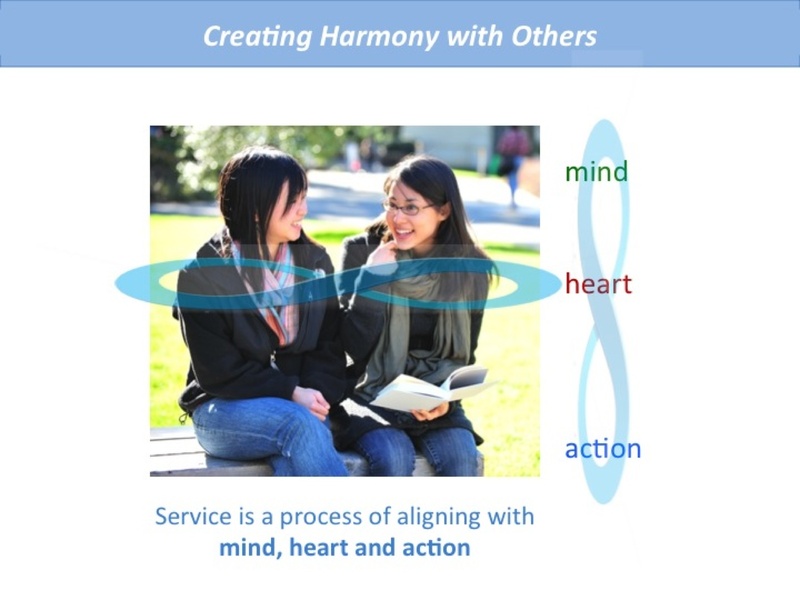 Creating Harmony with Others: Creating harmony with others involves developing a global perspective, which allows for many different ways of living. It is also about creating interpersonal dynamics that bring about compassion, respect and the highest potential of each person.We view the relationship between two individuals as a dynamic, on-going process of exchanging thoughts, feelings and actions (represented by the Möbius strip between the two persons in the diagram). Our hope is that through reflection and action, individuals will see the impact they have on each other, and can work towards greater harmony. From this perspective, when unease arises between yourself and another, you can offer your most compassionate self to the situation, and actively practice to further bring the relationship into alignment. We call this process adjustment. Adjustment within a relationship is the process of being conscious of the dynamics between yourself and another, and adapting to make the other person feel more comfortable and open. It does not mean you give up who you are, or your beliefs. It means you invite an other-centered perspective that allows you to trust yourself enough to maintain your sense of self while being of service to another. What relationships do you have that feel like they are in harmony? Why are these relationships the way they are? Where do you sense uneasiness in your relationships? What actions that are aligned with your values do you want to take to address the uneasiness? Harmony within Groups or Communities: Creating alignment between communities or groups can be very challenging work for leaders at every level of society. On the other hand, alignment can be very simple when we remember the interconnectedness we share as inhabitants of the same planet, and the fact that we all hold common core values, such as peace and respect. 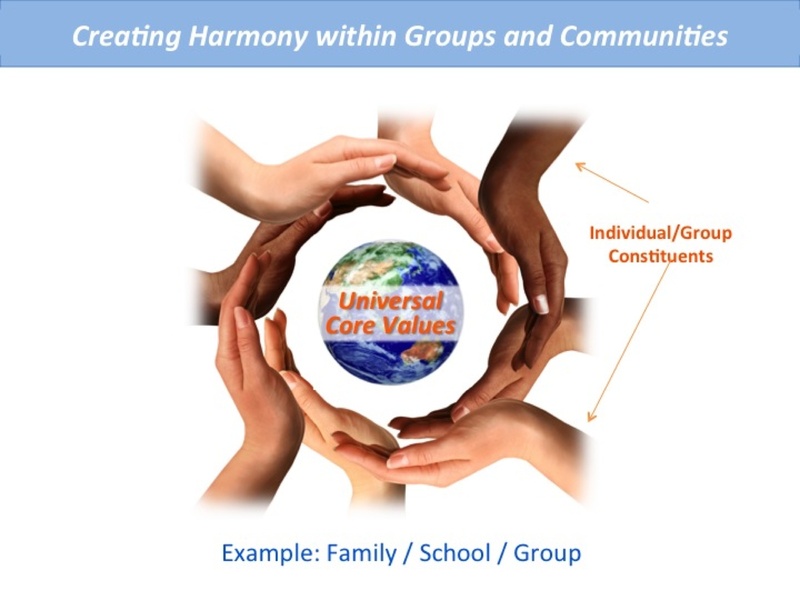 We believe that all people have a desire for happiness and to live fully and that alignment is possible between communities when people focus on their shared core values.Within a community, the group will only be as strong as the individuals that come together to support the hub of core values. In addition to the dynamics within a community, every community is connected to other communities. The recognition of our interconnectedness is the beginning of a new journey towards global harmony. What clubs, groups or communities are you a part of? What is one value shared by two or more of these groups? How would you act as a catalyst to bring greater harmony to diverse groups?